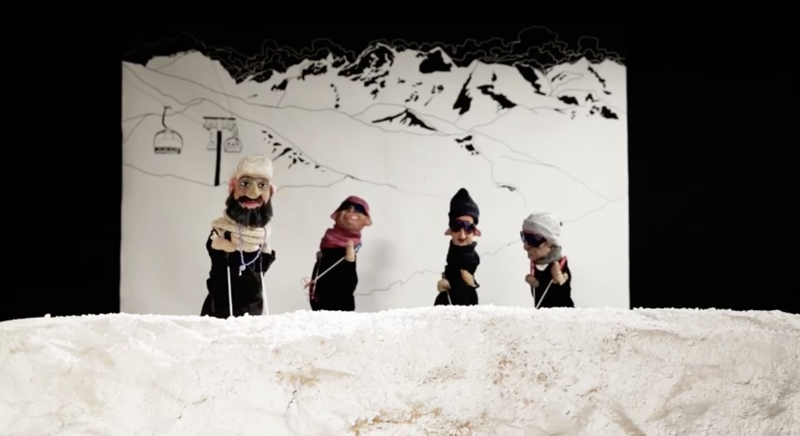 In this interview with the Shubbak Blog, Masasit Mati talk about their new series Top Goon Reloaded: Intimate Diaries of Evil; how they are turning their satire on the international community; and the creative force that is holding strong in the Middle East. Aimee Dawson: Can you tell us what the collective has been up to recently? Masasit Mati: So far we have released two series in 2011 and 2012 and then we felt that, with the escalating situation in Syria, it no longer made sense to just do it online and so we began to do a lot more things on the ground there. AD: And that was, in part, a move to try to help morale and show solidarity with the Syrian people? MM: Exactly, it was about taking it to the streets and showing that our work is not something that is disconnected and that just happens digitally but that it aims to bring people together. A lot of people were inspired by that and began doing puppet theatre themselves and that was really cool. Then, of course, with all of the shelling and barrel bombs and the presence of the Islamists, even this small space of freedom disappeared, so we are back to where we started – online. It’s a bit sad but at the same time we felt we wanted to take the work further and talk not only about Syria but also about the lack of reaction from the international community. There are more similarities in other crises and other countries than people realise and we are all connected. So that’s where we got the idea for the new series – Top Goon Reloaded. We have taken different forms of dictators that exist all over the world, not only in the Arab region. AD: So the new series for the Shubbak Festival includes new international characters – are they recognisable people from real life, as with Bashar al-Assad in your previous series, or are they more based on stereotypes? AD: Since 2011, all of the Masasit Mati team have been separated in different countries. Where are you all based now? And how do you work in this way? MM: Unfortunately, we are now based all over the world and some of us have had to move from country to country. Some are still in Syria but they were unable to take part in this production for Shubbak. There are some in Lebanon, Germany and France. The people doing the acting and filming are all in Beirut and the scripts are written remotely over Skype. It’s actually a long process because after the Artistic Director and the Script Writer decide on things they feed it back to the actors and the puppet makers and they make their own suggestions, and so it goes back and forth. It’s not easy and it’s very time consuming but it’s also very inspiring to work through these things and find a way. AD: It speaks a lot to how useful online media and communications continue to be for artistic production within the Middle East. You said earlier that when you were working on the ground in Syria in 2013 people got involved in the puppetry. Syria has a cultural tradition of puppetry so your work seems to be really reviving this heritage and bringing it to the fore there. MM: There have been so many things just reduced to political discussions and people forget that there are initiatives that really use arts and culture to preserve the very nature of being human – we like to laugh and enjoy things, we need that to exist. The irony and the sarcasm that the Syrians retain even today with everything that is happening is quite astonishing. It shows us their strength and their determination to not just see themselves as victims. There is often this political tactic to remove the human face within these crises and we wanted to highlight that again. But we are not the only group that are active and this is something that is really positive despite the torment of news that we hear every day. AD: What are Masasit Mati’s upcoming plans? MM: We are really curious to see people’s reactions to this new series. It has been a while since we last worked on Top Goon and we really enjoyed the production after having that distance to look at things differently. It will be great to see people’s reactions and then decide how we want to go on after that. We are determined to do so and as an open collective people often come and go. So we hope people will see that there’s a bit of a different visual approach this time, especially in the way the backgrounds are produced. We hope people will relate to the theme and give us new ideas. AD: One last question – can you tell us your though about this year’s Shubbak Festival programme? Can you pick some favourite events? MM: There are so many great events on at this year’s festival and it’s sad that none of us will be able to attend. It’s great to see so many films by Michel Khleifi who is a fantastic director and a good friend. There are also lots of really interesting dance performances and concerts – Hello Psychaleppo is a favourite. We are tired of this representation of folkloric, nationalistic, traditional cultural production so I think its very important to have these kinds of festivals and to show that there’s a lot of creative and inspiring work that is being done in a different way. There’s a strong creative force in the Middle East. Watch Masasit Mati’s new series Top Goon Reloaded: Intimate Diaries of Evil. You can watch their previous series here.